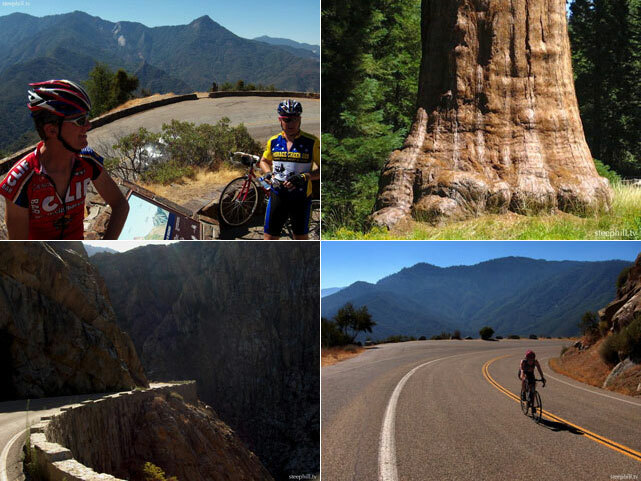 Cycling Sequoia and Kings Canyon National Parks. 60 photos and movies by Steven Hill and Rebecca Heald. This past weekend, Rebecca and I participated in a really nice, informal, two-day bicycle tour through the Sequoia and Kings Canyon National Parks in the Sierra-Nevada, California. These parks protect some of the most stunning habitats you'll find anywhere. The huge elevational range (1,500' to 14,491') in this region features immense mountains including Mt. Whitney, the tallest mountain in the lower 48 states; huge trees including the General Sherman Sequoia Tree, the largest (by volume) living thing on earth and deep canyons including Kings Canyon which is deeper than the more famous Grand Canyon in Arizona. Recorrido en bicicleta de montaña con alforjas siguiendo la Vía de la Plata desde Sevilla hasta Zamora, para en Granja de Moreruela, tomar el Camino Sanabrés que nos conducirá hasta Santiago de Compostela. I have not forgotten to train myself. One of the very typical daily tours lead me to the 'HEIDE' (a local recreational area) A trail, which starts right in front of my house and consequently ends here... Distance: a rough guess: 23 kilometers (about 15 miles) . Climbing, moderate, up to about 550 meters elevation. Duration: with a short rest and a beer: 2 hrs. Enjoy the pictures and my report. Good luck to all my followers! Itinerario en bicicleta de montaña con alforjas que partiendo de Tortosa, a orillas del río Ebro, cruza la Comunidad Valenciana de norte a sur por las montañas del interior, finalizando junto al río Segura ya en Murcia. Circulando por sus comarcas interiores (Tinença de Benifassà, Els Ports, Alt Maestrat, L´Alcalaten, Alto Mijares, Alto Palancia, Los Serranos, La Plana de Utiel-Requena, Valle de Ayora-Cofrentes, Canal de Navarrés, la Costera-Valle de Albaida, El Comptat y El Vinalopó), a lo largo del recorrido se visitan gran parte de sus macizos montañosos (Benifassa, Els Ports, Maestrat, Penyagolosa, Sierra de Espadán, Caroig, Sierra Calderona, Sierra Mariola, Sierra de Aitana y Maigmó), y algunos de sus parques naturales (Tinença de Benifassá, Penyagolosa, Serra d´Espadà, Serra Calderona, Chera-Sot de Chera, Hoces del Cabriel, Serra de Mariola y Font Roja). La ruta sigue fielmente el itinerario Travesía de la Comunidad Valenciana (Fredes-Pinoso), diseñado por Aníbal, incansable "biker", gran conocedor de la Comunidad Valencia y sin cuya aportación no hubiera sido posible, por lo que desde aquí quiero expresar mi más sincero agradecimiento. Travesía de los Pirineos franceses en BTT (Banyuls-Hendaye). Recorrido en bicicleta de montaña con alforjas que cruza los Pirineos de este a oeste, desde el Mediterráneo (Llança como punto de partida) hasta al Atlántico (y Hendaya como punto final). Toma como referencia la guía "La Traversee VTT des Pyrenees Françaises", de Georges Veron y editada por Altigraph Edition, siguiendo su mayor parte su itinerario principal. Ya en la región de Midi-Pyrenees (los departamentos de Ariege, Haute Garonne y Hautes Pyrenees), a donde entramos siguiendo el Sentier Cathare (por los castillos de Puilarens, Roquefixade, Montsegur y Foix), seguimos el antiguo Chemin de Piémot, que nos llevara por las Gorges de la Frau, l´Ariege, el Couserans (por el Col de la Core), el Valle de la Garonne (pasando por el Col de Portet d´Aspet), el Vallé de Ger, la Neste, l´Adour (cruzando les Baronnies) y la Gave de Pau. Por último, y ascendiendo los puertos de Soulour y l´Aubisque, entramos en la Aquitaine (departamento de Pyrenees Altantiques), donde recorreremos Gave de Ossau, Gave d´Aspe, Béar, Pays Basque, la Soule, Bass-Navarre (pasando el Foret d´Irati), la Nive-Nivelle, para terminar a orillas del Atlántico en la desembocadura del Bidasoa entre Hendaye e Irún. As a bicycle traveler, I have been lucky to book a bike tour at the local organization bikingtoursoflima. Located at Miraflores. Not far from my hostel (Pirwa). Pirwa hostel is somehow better as rated and described at tripadvisor... So, the bike tour has been quickly organized. This time, I have been lucky. It worked! I have been supplied by a bike. You should know, Lima's roads are not made for bicyclists. They are wide, but the traffic is so heavy and car drivers are so 'nervous', that you may quickly will be run-over, once you show up on road. Most of the cross roads throughout the city, we have pedaled on sidewalks. No way - it seems to be a must! Once you reached the shoreline it is a very scenic place. The road follows the cliffs. Very nice. Right in the middle of Miraflores there is a food mall located. With extreme high class restaurants. Worth to go! Some Peruvian Soles could be spent there... Remember, we are now nearly on sea level. The typical Peruvian elevations are over by now. But the cliffs makes you ride on rolling hills. As we hit just some of the suburban villages down South, as e.g. Barranca and Corrilleres it didn't exhaust us to much. In this area, you may not find any signs of Inca culture at all. Lima-Miraflores is a place, where the well-doing upper class people live. See impressions from the ride at the pages below! Enjoy the pictures. Good luck to our followers! The tour starts at Cusco. The major capital city of the Incas. At Cusco you may find at least, if not thousands of travel agents who are offering the Inca trail tour and others. I have planned my tour in advance and... was cheated by an agent 'info@mapitrekperu.com'... Just $ 150,- which I have been asked to send via Western Union to Jenny Maribel Machacho Quispe at the address of Calle Hatun Rumiyonc Nr. 487, Cusco Peru. Emails bounce back, Telephone cannot be 'completed as dialed', their web-page does not exist anymore. But at Cusco I contacted the tourist police and they told me, this lady has many cases and is already ordered to court. Without a tour guide, it wouldn't be wise to take the trail. For many reasons. Security is one, food and drink supply another. Check out the correct route another (not to found in a Coca jungle laboratory, whereas the 'shining path' protects the business). The hike up to the Machu Picchu ruins is not for mountain bikers as well. The path is so steep, that even young people give up and walk on the winding road up. But there the conflict with the never ending line of tourist buses start. The road is ruled by the bus drivers. Man, they can be rude. The road is narrow and they drive their way, no matter if a tourist is in their way... Sometimes scary. I tried to book a bicycle tour, as I did on other locations at Bolivia and Peru... It has not been working out. The guys from bikeperu.com didn't find the time for a reply... No bicycle means automatically to find other means of transport - the car of the hostel keeper (Marco from Pirwa hostel Nazca). Nazca is a sort of rural place. It takes nearly 7 hours to go down by bus from Lima. You may meet people from all over the world. The way down to Nazca is on good paved road with wide shoulder. But there is low infrastructure in between. Let's assume you bike down on the Panamericana Sud, you have to plan your stay carefully in advance. It is a very dry, hot and sandy area. Never have seen a single bicyclist on the road. 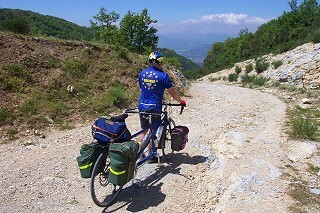 The high elevations are over...; nevertheless you may find 'rolling hills - a coastal road is never totally flat. The last part down to Nazca is 'inland' with some minor hills to climb in between. I have refused to fly over the lines. They have two steel structure platforms, whereas you may see a lot of lines. Figures etc. Most of the lines go back to 800 before Christ. They belong to the times before the modern Inca. [...] Enjoy the pictures. Good luck to our followers! Many times I have checked at the Internet this ride... Now, dreams has come true... The Death Road, or as it is called 'the most dangerous road of the world" is the ultimate downhill ride. People from all over the world doing this, and try to get a kick. I did it with the support of 'Gravity Biking'. A very reliable organization, which I really can recommend. They have experienced tour guides, who makes this ride easy and safe. Gravity Biking also provides the bike. We had blue sky weather, with some exceptions, e.g. when crossing a waterfall, or a misty jungle area. You should take into consideration, the start is elevated at a height of 4.700 meters, finally going down to 1.250 meters. Passing at least 3 climate zones. 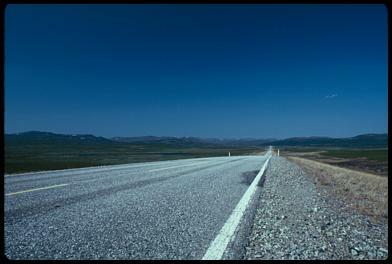 The road comprises a ride on paved road, round 13 kilometers and about 47 kilometers on dirt road. Hanging cliffs, makes the ride somehow scenic (...and dangerous). Please note: when entering the lower part of the road, just before the paved roads ends, you are passing a local police check point. It may happen that even tourists are forced to undertake a drug test. Because this area is known as one of the Coca farming area. Coca leaves has two sides: one is the Coca leave tea, which is legal and a rather good medicine to overcome height sickness symptoms. The other side is the processing the Coca leaves in jungle laboratories and traffic the final product. They say, the "shining path" organization today comprises no more than 50 people which protect the Cocaine trafficking. This has been a counter visit of of our German biking friends from Hamburg. Beate, a powerful riding lady; Norbert with an E-pedelec and a very good Li-battery has been accompanying us on our 3 day tour. My daughter Anne and her boyfriend accompanied us on our first day of riding. We ended the tour by riding through the Thaya national park, as our German guests decided to continue riding back home using some popular trails in Czech Republic. I am still impressed of the performance of our guests. They have been riding the national park trail with all their heavy luggage (which I called 'stone collection'). Enjoy the pictures and comments. Good luck to our followers! Recorrido en bicicleta de montaña con alforjas desde Almansa, pasando por Cuenca, hasta Burgos siguiendo el Camino de Santiago-Ruta de la Lana. Incluye el enlace del Camino de Levante, en Almansa, con la propiamente llamada Ruta de la Lana, en Monteagudo de las Salinas. Itinerario en bicicleta de montaña con alforjas desde Ponferrada hasta Espinosa de los Monteros, que recorre la Cordillera Cantábrica pasando por muchos de sus macizos montañosos más representativos. Sigue la ruta descrita por Juanjo Alonso en la guía Transcantábrica en BTT editada por la Editorial Desnivel, coincidiendo en gran parte con el recorrido ciclomontañero.